Andy Reynolds has spent his entire life enjoying the small-town charm and enriching lakeside activities of the Lake Wylie area. And now, as a Realtor in both North Carolina & South Carolina, he has been able to help many families find homes that provide them the opportunity to experience all the joys this area has to offer. Specializing in Lake Wylie Waterfront and custom homes, Andy is well equipped to help you find your very own paradise in the beautiful Lake Wylie area. His local expertise and extensive customer service experience will be very beneficial in all your Real Estate endeavors. He takes great pride in helping clients find the real-life version of their dream. His extensive background in the sales and service area has earned him the “Top Gun Award” for sales volume. He has also lead his service team to the Number #1 Ranking for the highest customer satisfaction award. So, whether you are selling your Lake Wylie waterfront or area home; or looking to buy your Lake Wylie dream home, you can be assured of his commitment to you. He is currently ranked in the Top 1% of all Keller Williams Agents throughout North Carolina and South Carolina. Numerously, he has been named Top Agent of the Month and he has ranked as one of the Top 5 Agents in the Multiple Listing Service for the area. As a Certified Negotiation Expert he can effectively negotiate on your behalf at the closing table or all types of Real Estate transactions. 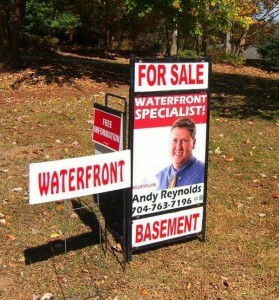 Andy is a member of the Piedmont Realtors Association and the Charlotte Realtors Association. He is an elected and serving member of the Associates Leadership Council for the local Keller Williams office. Currently ranked in the Top 1% of Keller Williams Agents throughout the North Carolina/ South Carolina region, Andy has been named Top Agent of the Month multiple times in his office. He is consistently ranked in the Top 5 Agents of Areas 15 and 17 of the NC/SC Multiple Listing System and in the Top 5 out of over 100 Keller Williams Agents serving the Fort Mill, Rock Hill, Belmont, Lake Wylie and South Charlotte area. As a Certified Negotiation Expert, Andy is skilled in all types of Real Estate negotiations. Andy Reynolds will dedicate 100% of his experience & knowledge to helping you make a great decision whether it be helping you position your home in the marketplace to maximize the most return or helping you locate your dream home! You can be confident that you will achieve the best results. Andy utilizes the latest technologies, market research and business strategies to meet your expectations. However, more importantly, he listens and that means he finds solutions that are tailored to you. As Andy always says, “From sign up to sign down, I work for you”.